Less than 2 hours to New Year's Eve fireworks display, huge hotel catches fire in center of UAE metropolis. Less than two hours before the New Year's Eve fireworks display in Dubai, United Arab Emirates (UAE), a massive fire broke out at The Address Hotel, a central building in the city. The building is located right next to the world's tallest skyscraper, the Burj Khalifa, reports BBC. The fireworks display was to be held from the Burj Khalifa, with officials saying it will go ahead as planned. It remains unclear what set off the massive fire, which has caused burning debris to plummet from the blazing building. Government sources revealed the fire started on the 20th floor of the 60-storey hotel. Firefighters rushed to the scene, with UAE civil defense officials initially saying there were no casualties before the government admitted there are "minor injuries." Authorities report 16 people suffered light wounds, and 90% of the fire is under control. 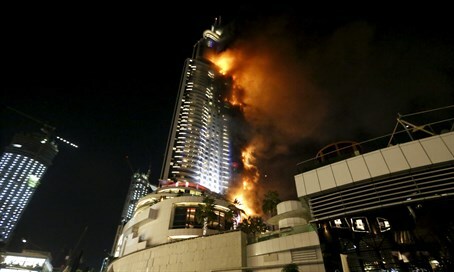 Civil defense teams are working to evacuate the hotel, reports the Twitter feed of the Dubai government's media office. According to witnesses cited by Reuters, huge tongues of fire shot upwards from the luxury hotel, which is located across a plaza from the Burj Khalifa. Hundreds of people had been gathering in the plaza for the fireworks display, before being evacuated by the authorities. The Address Hotel, a five-star hotel and apartment complex, stands 300 meters (1,000 feet) tall, while the Burj Khalifa is 829.8 meters (2,722 feet) tall, making it the tallest building anywhere on the globe.